I’ve been wanting to write a Pilgrim’s Progress-style allegory for young children. Here it is. Happy Easter, everybody. Once upon a time there was a wonderful king. He had very many children and they all lived in a beautiful castle high on a mountain. One day the king told his children that he was sending them on an important journey. They had to go on a long walk through the whole world. The king said that they had to do this in order to grow up. “Will it be hard?” the princes and princesses asked. Accordingly, here is every Topical Guide entry for “grace,” with that key word replaced by “enabling and strengthening power.” Many of these verses truly do open up this way! thy servant hath found enabling and strengthening power in thy sight: Gen. 19:19 .
for a little space enabling and strengthening power hath been shewed: Ezra 9:8 . Lord will give enabling and strengthening power and glory: Ps. 84:11 .
pour upon the house of David … spirit of enabling and strengthening power : Zech. 12:10 .
enabling and strengthening power of God was upon him: Luke 2:40 .
enabling and strengthening power and truth came by Jesus Christ: John 1:17 .
great enabling and strengthening power was upon them all: Acts 4:33 .
gave testimony unto the word of his enabling and strengthening power : Acts 14:3 .
through the enabling and strengthening power of … Christ we shall be saved: Acts 15:11 .
the ministry … to testify the gospel of the enabling and strengthening power of God: Acts 20:24 . By whom we have received enabling and strengthening power and apostleship: Rom. 1:5 . Being justified freely by his enabling and strengthening power : Rom. 3:24 .
it is of faith, that it might be by enabling and strengthening power : Rom. 4:16 . An ancient Hebrew tradition held that the Messiah would be born at Passover. We know that April in the meridian of time indeed fell in the week of the Passover feast—that sacred Jewish commemoration of Israel’s salvation from the destroying angel that brought death to the firstborn sons of Egypt. Each Israelite family that sacrificed a lamb and smeared its blood on the wooden doorposts of their dwelling was spared (see Exodus 12:3–30). Thirty-three years after Christ’s Passover birth, His blood was smeared on the wooden posts of a cross to save His people from the destroying angels of death and sin. There’s a joke that Mormons are the only people in the world who can communicate a profound spiritual sermon by drawing three circles in a row. 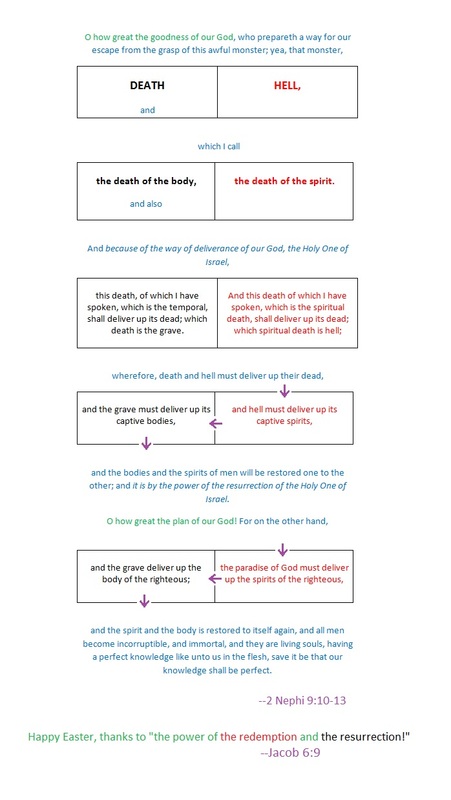 This traditional paradigm for teaching the gospel—with its circles for the premortal world, Earth life, the spirit world, and the three degrees of glory—has served very well as a visual aid of the plan of salvation. Here, I propose a new way of visualizing these things. 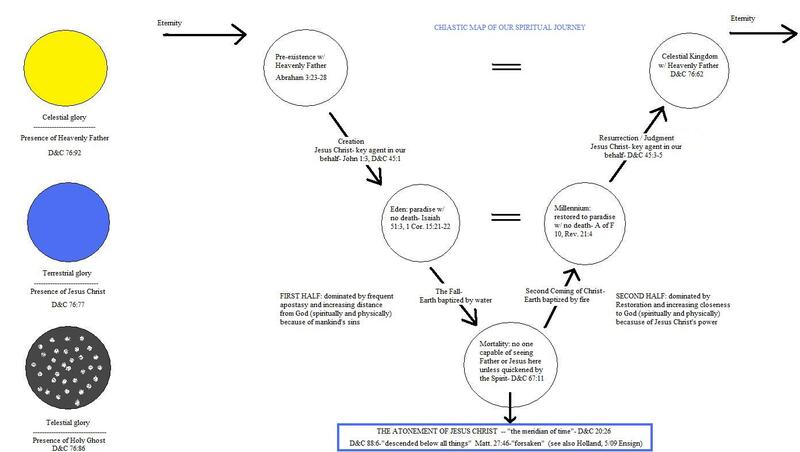 Instead of the narrative flowchart model, I’m going to describe a great, eternal chiasm. Yes, chiasmus as in the ancient Book of Mormon writing style where a series of ideas or phrases are given and then repeated in reverse order, to contrast parallel variations in the elements of the story and to highlight the central turning point. Chiasms are typically shown as the left side of a letter X, looking like an arrow pointing to East on a map. This one will be depicted as a letter V, because I want us to see the turning point as the end of a long descent and the beginning of an ascent. You’ll see why shortly. This new paradigm was inspired by the temple. I won’t make any overt references to the basic floor plan of the average temple or to the content of the endowment, but the reader who is familiar with those things is encouraged to consider how they suggested the ideas presented below. The elements of this story can be understood as following the ideal progress of each individual person or of “the whole human family of Adam” (Mormon 3:20). Our journey, as far as we understand it, both begins and ends in the Celestial Kingdom. This is where, from our point of view, our “descent” begins and our “ascent” ends. This week I finally saw Ingmar Bergman’s Winter Light. What a beautiful film, in many ways. I absolutely loved it. The most striking part, though, was a scene near the end where a supporting character gets his screen time to talk to our protagonist, a pastor plagued by doubt and melancholy. The church sexton confesses to the pastor that our apparent understanding of Christ’s suffering is superficial, limited to the cross. He wonders if the emotional suffering of Gethsemane, and the spiritual elements of the crucifixion might not have been worse. He describes these scriptural details in a way that deeply intensifies the Lord’s suffering. I sat up pretty straight during this scene. His confused reaching for truth brings him so close to a Latter-day Saint knowledge of the Atonement. I wanted to tap him on the shoulder and talk about the Book of Mormon. I wanted to show him Jeffrey R. Holland’s Easter talk below. Sadly, YouTube doesn’t have a clip of just this scene. It starts around 7:00 in the 7th video in the linked playlist, and runs about 40 seconds into the 8th. 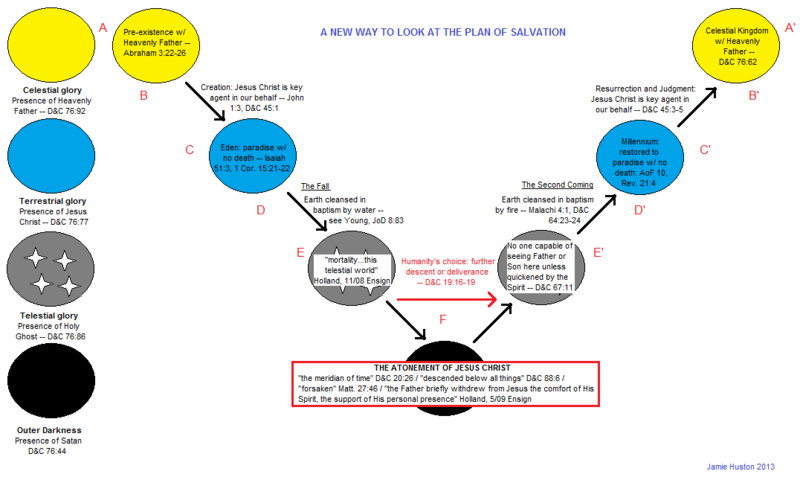 Last Sunday in Gospel Doctrine, we discussed Jacob chapters 1-3 in the Book of Mormon. I noticed that Jacob says that his sermon in chapters 2-3 was given “in the temple” (1:17). I looked through the sermon to see if perhaps that setting influenced the content of his message. Jackpot. Consider just the broadest outline of the address. Jacob begins his sermon by telling the people that he was fulfilling his duty as a servant of the Lord (the “all-powerful Creator of heaven and earth,” he takes pains to note from the start, in 2:4) by bringing them an authorized message (2:2-11, especially verse 11). The first major doctrinal topic that Jacob broaches, in 2:12-22, is the necessity of giving up our worldly gain and selfish desires for the good of others and the work of the Church. Look at some of the Topical Guide subjects listed in those verses: almsgiving, generosity, welfare, worldliness, good works. Jacob ties these themes of sacrifice in to a general command to obey the commandments (2:21), and, being the Book of Mormon, warns against pride. Does the Atonement Have Masculine and Feminine Halves? What Was the Mark of the Curse in the Book of Mormon? A comment on a news article last week called the Book of Mormon racist because of its references to dark skin in conjunction with a curse. I responded with the usual explanation: the curse is spiritual separation from God (2 Nephi 5:20), and the dark skin was just a useful way to distinguish those who’d been cursed. However, the more I looked at what I’d written, the less satisfied I was. I felt like I was missing something. I went back to the text. I don’t think the Book of Mormon references to dark skin are literal anymore; I think they’re only a poetic idiom. Subsequently, I now have a different theory for what the mark of the curse really was. 3 Nephi 27:14 is one of the more rhetorically clever verses in the Book of Mormon. It features an ironic parallelism that explains the point of the Atonement while emphasizing its apparent absurdity. The part in bold is what’s so impressive. There are several other passages in scripture that speak of Christ being “lifted up” in crucifixion, and a few of those link that with the salvation of mankind, but this verse uses the phrase “lifted up” twice, first to describe the sacrifice of the life of Jesus Christ, and then to summarize the Father’s ultimate goal of saving mankind. I’ve been reading James Ferrell’s The Hidden Christ, which is extremely excellent, and I just read chapter 19, “The Dispensation’s of the Lord’s People,” where he gives a chiastic chart of Earth’s history. It’s very good, and it reminded me of something I’ve been thinking about for a month or so, since my wife and I had a discussion about what the Earth will be like after the Second Coming. That got me to researching, and some things clicked with me. Below are some notes I’ve been putting together about these thoughts. They represent my attempt to put some doctrinal concepts in a recognizable pattern, and it strongly emphasizes the role of Jesus Christ. In fact, looking at our spiritual journey this way adds a powerful dimension to our understanding that, through the Atonement, Christ “descended below all things.” We can see here that, literally, his suffering and distance from the Father were absolutely beyond even the worst of mankind’s experience. It was also, again quite literally, the ultimate turning point in history. The only thing that confused me at first was the idea that, if Eden and the Millennium are Christ’s domain, then how could the Father also be present in the Garden of Eden? I soon realized that God may go anywhere He wishes; it is we who are limited by veils and sin. After all, didn’t both the Father and the Son appear personally to Joseph Smith in this fallen, telestial world? Joseph Smith had to be transfigured for that to be possible, and I suppose Adam and Eve must have enjoyed a similar experience, in their innocent and immortal state, to behold the Father in the Garden. On a slightly less spiritual note, this map also highlights an aspect of good storytelling, which has also been on my mind lately. I often think that basic story patterns are essentially encoded into us (think of Campbell’s Hero With a Thousand Faces, as well as the fondness for using elemental stories to resonate with us in the scriptures and temple), and one of the most fundamental aspects of good story is that the hero must face a daunting, scary setback in the middle, even suffering a literal descent. Think here of Odysseus going down to Hades, the discouraging tones of The Two Towers and The Empire Strikes Back (each the middle of an epic), or the predictable fight that the lovers must have in the middle of every romantic comedy, before they reconcile and reunite (sappy, but also another Atonement-centered device). Most of the “insights” on this chart aren’t very original, but I enjoyed drawing it up to see these things together in graphic form for the first time. This is only a rough draft, and any refinement to it is welcome. Click to enlarge.